The Broke and the Bookish : Kelly reviews "Jane: The Woman Who Loved Tarzan" + giveaway! Kelly reviews "Jane: The Woman Who Loved Tarzan" + giveaway! Confession time: I've never seen the movie Tarzan. *covers face* Am I not a horrible 90s child? However, I still am obviously familiar with its concept, derived from the stories of Edgar Rice Burroughs. In Jane, Robin Maxwell takes on the same story all from Jane's point of view. We get a look into her background, upbringing, and family life. The story is told in a frame method, starting and ending in the "present," which is the year 1912. In the meantime, Jane reminices about the beginnings of her journey to Africa and her time with the wild ape-man Tarzan (approximately in the year 1907). The first few chapters about her schooling as the only female medical student at Cambridge admittedly bored me to tears and took FOREVER to get through, but once she and her father were well on their way to Africa, the plot picked up and it became immensely more enjoyable. She and her father are told that the trip is to find "ape-men," or species living in the jungles that are not quite ape, but not quite human. We (and Jane) learn that this is not the real mission, which leads to tragedy and Jane later being found by Tarzan and so begins her life in the jungle. I greatly enjoyed the parts where Jane found the diary Tarzan's parents kept and wrote in, it was a story in itself. I found his parents' interactions with the ape-men, and the ape-men as a whole, intriguing and eerie in an almost sinister way. Can you imagine being marooned on a beach for years, then one day noticing some unknown creature watching you? Shivers! One of the more confusing parts of the story was the timing. 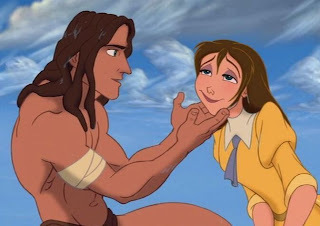 I have absolutely no idea how much time passed while Jane was with Tarzan in the jungle. Was it a few weeks, months, years? It's all very ambigious. Also, sticking to historical accuracy, Robin Maxwell has added a subplot of the Belgian wars/riots/takeover of western Africa....I can't even think of the proper word for what was happening because I was clueless and the politics weren't explained that clearly. It was more confusing than beneficial to the plot. However, I thought the story overall was wonderful. I liked reading about how Jane, a female raised in the Victorian/Edwardian eras, reacted to be thrown into an almost primative and desolate lifestyle. Jane isn't your typical heroine, but she's definitely one to learn from. 4 stars. Now, a giveaway! Since I am too lazy to make a Google doc form for you guys to fill out, just leave your favorite Disney movie in a comment, along with a way to reach you (email, Twitter, blog,etc. ), to be entered to win a copy of Jane! The winner will be contacted some time next week. Good luck! The book sounds good, maybe I'll pick it up some time later! My twitter is @katieisperalda, and my blog is Fiction Predictions (link is on the name I commented with). humm fav disney movie.. ill have to go with the most bookish of Disney Princesses , Belle, in Beauty and the Beast! My all time favorite Disney movie is The Little Mermaid with Beauty and the Beast a close second! My absolute all time favorite is Beauty and the Beast. But Mulan and The Princess and the Frog gave it a pretty good run for its money. You can contact me on Twitter at @Carmabeth. This sounds really fun :) My favorite is Beauty and the Beast! My favorite Disney movie is The Little Mermaid from my daughter's childhood and Cinderella from my childhood. One of my little sisters was a huge fan of the original Tarzan movies, and watched them over and over again. One of the series, I think it was the second movie, showed Jane skinny dipping and was considered quite scandalous at the time. Aladdin, Lion King, Beauty and the Beast, and Mulan are all tied. I do love Tarzan, though. Beauty and the Beast for sure. Hello? That library! Cinderella will always be my favorite, although I don't think it's the all-time best Disney movie. I also love Tarzan, as it reminds me of when I was pregnant for the first time, and I still love the music. It is fortunate that so few women have read the Tarzan story. It is actually a love story. One woman Who read "Tarzan of the Apes" ,first of the series of 24 books, claimed the book had ruined he interest in men. How can anyone compete with Tarzan. We are all second rate with the comparison.